We were made aware that Western blot data in some of the figures for the above referenced paper were inappropriately assembled resulting in duplications of bands. Because we believe that the presentation issues are beyond the limits of acceptable scientific standards, we wish to retract this paper and regret any inconvenience to the scientific community this may have caused. 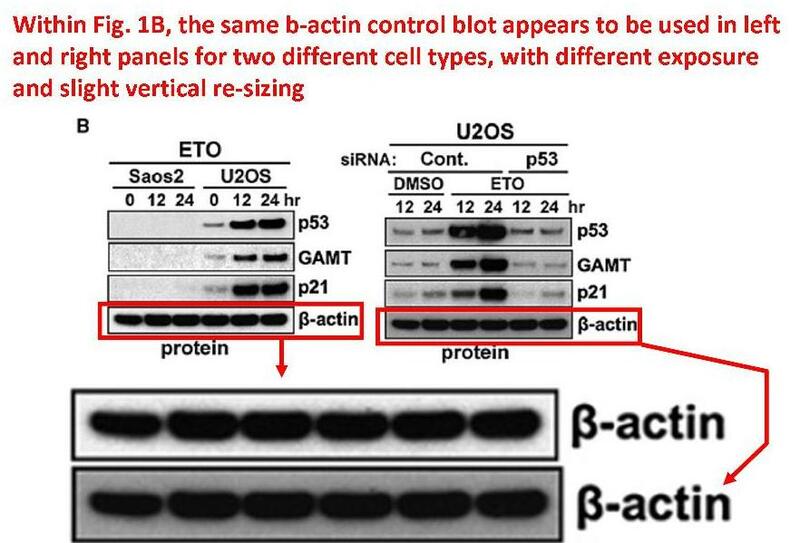 It was brought to our attention that Western blot panels in the above mentioned paper were duplicated. Further analysis of the published Findings as well as the raw data corresponding to the refereed experiments indicated that mistakes were made during Figures assembly. These issues prompted the retraction of the paper. The retraction comes two years after one scientist brought the issues in the paper to Molecular Cell‘s attention in August 2011. Whether that was the first scientist to raise a red flag, we don’t know. The paper has been cited 40 times, according to Thomson Scientific’s Web of Knowledge. Lee’s previous corrections were in Nature and Current Biology. “Presentation issues beyond the limits of acceptable academic standards…” What a relief, I though it was fraud. Just look at the mice in the Nature megacorrection, Just look at them. This is acceptable for Nature and for Harvard. What is the problem with the image? It shows animal cruelty and gross breaches of the NIH OACU – ARAC guidelines. Many tumors are (far) greater than 10% body weight, and many are ulcerated. Agreed – these mice look to be far, far beyond the point at which they should have been euthanised. I absolutely agree this is unconscionable. Imagine the scale these practices are happening at, if this is just a picture of a “representative result.” I believe this should be brought to the attention of both internal and external overseers. I myself use rodents in my work and find these images absolutely horrendous. Additionally, if one bothers to look at the 33 supplemental figures for this paper, there are other irregularities, including Figure S10, which shows IHC staining for several proteins. It is clear that the background was adjusted differently for the control and experimental images, which will create differences in the signal to noise for the two states. I am sick of these articles in Nature and the like with 20, 30+ supplemental figures. This practice alone invites all sorts of abuse. You are very helpful, Fernando Pessoa. Thanks your insights. Why to waste a good loading control? One of the most vexing issues in dealing with “irregularities” in the scientific literature is separating fraudulent activities from cases of oversight or sloppiness. This is a distinction that cannot be made flippantly. We all make mistakes, and the ramifications of simply being accused of breeching ethical standards can be tremendous. And any one of us who runs a lab has the potential to be “scammed” by the rare unscrupulous postdoctoral fellow or graduate student hellbent on data manipulation. So how do we really know what’s going on? I use two criteria to determine whether a scientist, particularly a lab head, is up to no good. First is repetition. It is unlikely that somebody who has gotten away with inappropriate data manipulation once, and sees it as a short cut to publication, will stop. And if the lab head is somehow involved—either directly, by fostering a poor lab environment, or by turning a blind eye—data manipulation will appear in multiple publications with multiple different author sets (excluding the senior author). The second is intent. Do the actions increase the apparent impact and strength of the story, or are they neutral (or even negative)? True oversights will be randomly distributed between those that help the authors, and those that don’t. But if there is a consistent positive trend, such as error bars being too small, the number of mice being exaggerated, or persuasive western blots being reused throughout the paper, or even in different papers, then it’s pretty clear (to me at least) what is going on. Given that we don’t want to make accusations lightly, we should also be prepared to deal swiftly and effectively with cases that leave little room for doubt. I wonder what Harvard will do? Why should they do anything? They are Harvard, it is only the medium or lower ranked institutions that get worried by such things. If you insist Harvard do something then all that will happen is they will pick out some scape-goat from departed lab members, so it is better not to push the issue. Can I just add something to your carefully thought out schema – how does the lab head react when the issue is raised? Does he/she sends the matter off to the university ethics committee and tries to rectify the mistake/oversight or does he/she try to stonewall. If the latter, then they are at very least an accessory after the fact. Excellent points. If Harvard is unlikely to act, then we may well also ask what the NIH plans to do? Dr. Lee currently holds three R01 grants from the NIH, with direct costs totaling $986,957 annually. What is quite striking is that each of these three R01 grants can be directly related to one of the three papers that form the center of this issue. 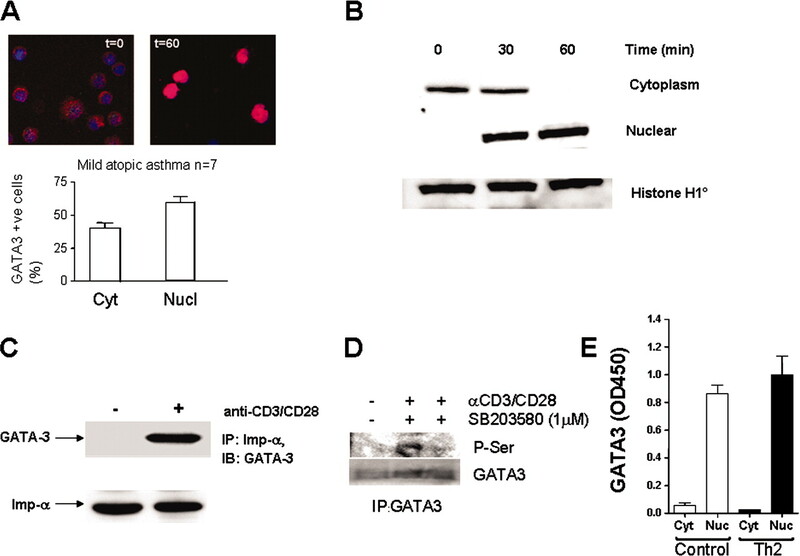 RO1 CA127247 “Role of an unusual GTPase in DNA damage response and carcinogenesis” focuses on RhoE, which was the subject of the Current Biology paper that had duplicated images and required substantial figure replacement. 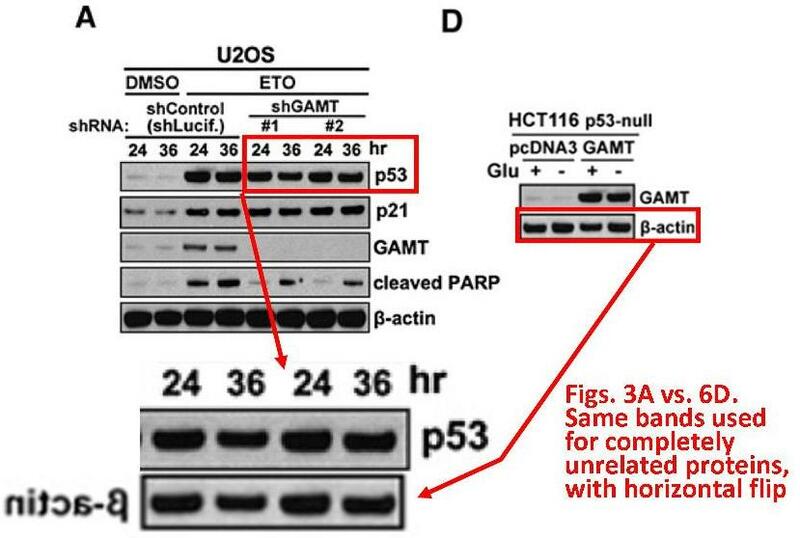 R01 CA142805 “Targeting ROS by a p53-activating agent for selective killing of cancer cells” is directly related to the corrected Nature paper (2011) that contained misleadingly small error bars, exaggeration of mouse numbers, and what appears to be the same mouse posing as four different mice. 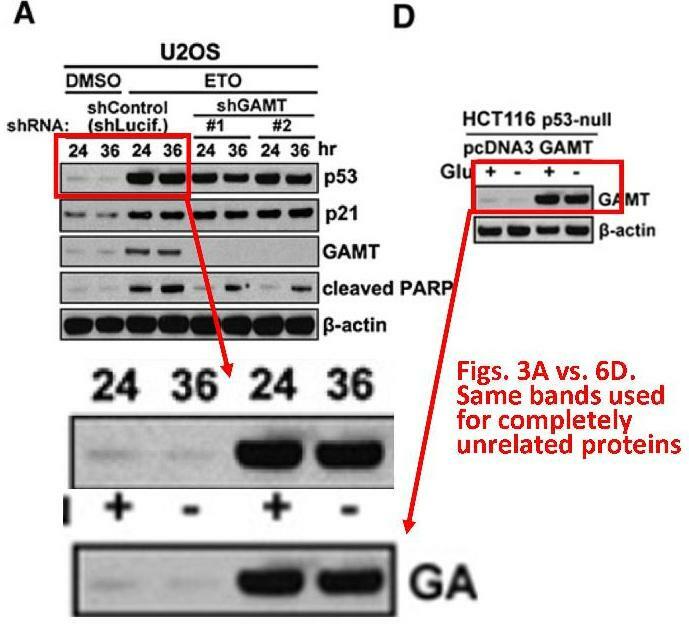 And R01 CA149477 “p53-GAMT pathway in cancer cell metabolism and DNA damage-induced carcinogenesis” is the topic of the just-retracted Molecular Cell paper. The NIH must investigate on behalf of the scientific community and the taxpayers who’s money they are stewarding. Like you, I do have concerns about any investigation scapegoating a poor-departed lab member, but hopefully one fact will help avoid this issue: only one person is an author of all three papers. It has been reported to the ORI; but then so was Michael Karin. Another too big to fail? Google reveals he’s been quite busy building a reputation…. These are not the types of website typically required by Harvard faculty who have a scientific reputation that speaks for itself. I would bet good money that Harvard is not aware of these sites, and does not approve of their name and imagery being used in this manner. Regardless, retraction watch FTW! Still the #2 Google hit for Sam W Lee. “smacks of some kind of forced public relations campaign”. 4 of the authors of the retracted paper Mol Cell. 2009 Nov 13;36(3):379-92 have written their own review on the topic of p53 and GAMT. Cell Cycle. 2010 May;9(9):1706-10. Epub 2010 May 10. GAMT joins the p53 network: branching into metabolism. Ide T, Chu K, Aaronson SA, Lee SW.
Cutaneous Biology Research Center, Massachusetts General Hospital and Harvard Medical School, Charlestown, MA, USA. is now defunct and the review needs to be removed from the literature? Dr. Lee’s web presence is indeed unusual and smacks of some kind of forced public relations campaign. Google “Sam Lee of Harvard” and see what you get… that phrase in particular sticks out as his official moniker. Then he is in rare company. Reputation enhancing websites were pioneered in the biological sciences by Anil Potti. Interestingly, Potti also has a wikipedia page devoted to his life experience that he is probably not allowed to edit the way he would like it. The 10 retractions are documented in detail. So perhaps he only has a smidgeon more than 110 publications now? CAUTION: Curious but unwary readers are strongly advised to avoid http://www.anilpotti.com/ under any circumstances. Unanticipated consequences of reputational enhancement: Who knew? I do wonder why Mol Cell has not retracted the review which deals with Mol Cell. 2009 Nov 13;36(3):379-92. It is in the same issue of the journal. Don’t the editors have “joined-up thinking”? Mol Cell. 2009 Nov 13;36(3):351-2. doi: 10.1016/j.molcel.2009.10.026. p53 and Metabolism: The GAMT Connection. Department of Biological Sciences, Columbia University, New York, NY 10027, USA. In this issue of Molecular Cell, Ide et al. (2009) have identified the enzyme guanidinoacetate methyltransferase (GAMT) that regulates creatine metabolism as a p53 target involved in apoptosis, reactive oxygen species (ROS), and fatty acid metabolism. Yes, good point david hardman. To correct the literature, this review should also be retracted, so I hope the editors inform the authors. It also would be worthwhile letting the reviewers of the original paper know as well, to help them be on the look out for duplications in other papers they might review. Duplications seem to follow SW Lee. For example, in J. Biol. Chem. 2004, 279:19643-19648. The dot plots in Figure 5B are all duplicated: a) BRCA1 (-/-) + LacZ, BRCA1 (-/-) + WT and BRCA1 (+/+)+S308N are exactly the same; b) BRCA1(-/-) + S308N and BRCA(-/-) + LacZ+IR are the same; c) BRCA1(-/-)+S308N+IR and BRCA1(-/-)+WT+IR are the same. This can’t be sloppy work because a few dots are deleted to suggest they are different dot plots (and artificially change the percentage of cells in the M phase), but 90% of the dots coincide in the duplications. In my experience with mammalian cell flow cytometry, this can’t be a real experimental result. Editors and reviewers should be trained to look out for duplications, as suggested. Is Figure 5B ( a key figure in the paper) fraudulent? In J. Biol. Chem. 2004, 279:19643-19648, parts of the dot plots in Figure 3C are also duplicated. Home found for comments on J. Biol. Chem. 2004, 279:19643-19648. Figure 7c. Lowest ATM panel. Please compare the bands in lanes 8 and 9 with the bands in lanes 3 and 4 respectively. Figure 4c left set of panels (not a duplication). ATM Ser1981-P panel. Vertical cn´hange in background between lanes 6 and 7. Unsure about slpicing in ATM panel. In its favour bands lanes 1 to 6 black, bands lane 7 to 9 grey. No vertical changes in background in the BRCA1 or tubulin (loading) panel. On the topic of duplications. A small thing. Proc Natl Acad Sci U S A. 2000 May 9;97(10):5208-13. Figure 3E. Please compare the bands in lanes 5 and 6. What about papers they write? I get the impression that in figure 2 I am seeing double. Please take a look at the lower left panel in figure 2A and the lower right panel in figure 2B. Figure 3 leaves me with the same impression. For example in the top panel in figure 3A several bands strike me as very similar. In figure 3D the bands in the Wb alphaChk1 panels look like the have been shunted over one lane. Home found for Mol Cell Biol. 2003 Nov;23(22):8161-71 at Pubpeer. 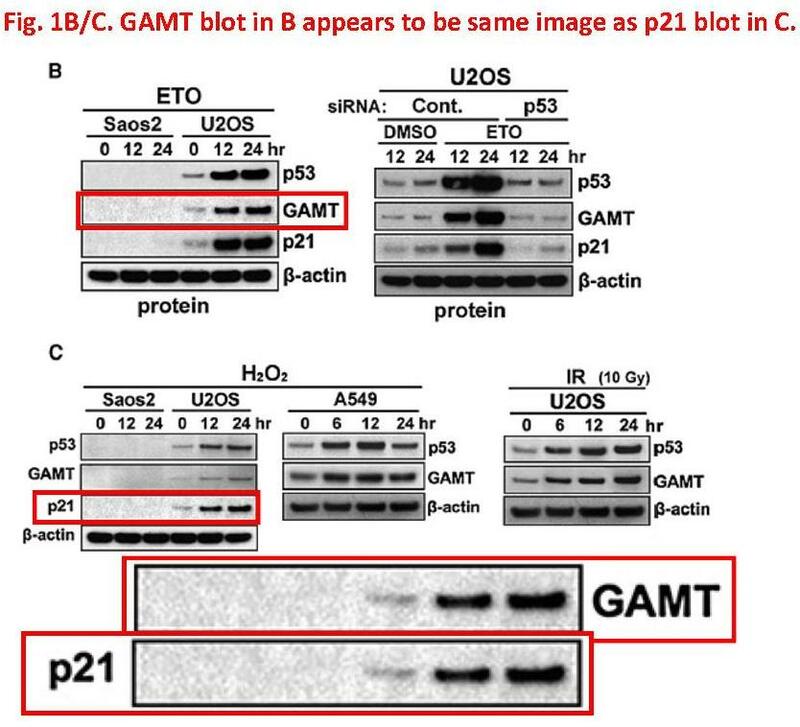 This is an old conundrum, but how to explain images from Oncogene (1998) 16, 1391-97 and Mol Cell Biol (2000) 20,1723-32 reappearing in Cancer Res (2001) 61, 1386-91 as something else? Mol Cell Biol 2000;20;1723–1732; PMID10669749 as different things? How to explain the similarities between 2 beta-actin blots? All of this discussion is really making me miss “Science-Fraud”. Pubpeer should be an adequate replacement, but that site deals with too many things at once—from minor issues with interpretation and lack of appropriate referencing, all the way through to the sort of stuff that we’ve seen with Dr. Lee. Also, the lack of a singular (albeit anonymous) voice makes it difficult to weigh the validity of the comments. I know Brookes talked about coming back with something new and improved, but there has been no update on his site for a while. Has anyone heard anything? Understand your sentiments. RW is quite good at allowing discussion and presentation of things that don’t quite fit. How to explain image reuse in Cell 2007;130;624-637; PMID17719541 ? Proc Natl Acad Sci U S A. 1997 Sep 2;94(18):9648-53. From the numerous examples of image reuse above the Bayesian landscape has shifted. In figure 6 the lower p53 bands and the WAF1/p21 bands are quite similar. The images do have differences, but also similarities. My first thought was that the membrane had not be sufficiently stripped, but the upper p53 bands do disappear in the WAF1/p21 section. 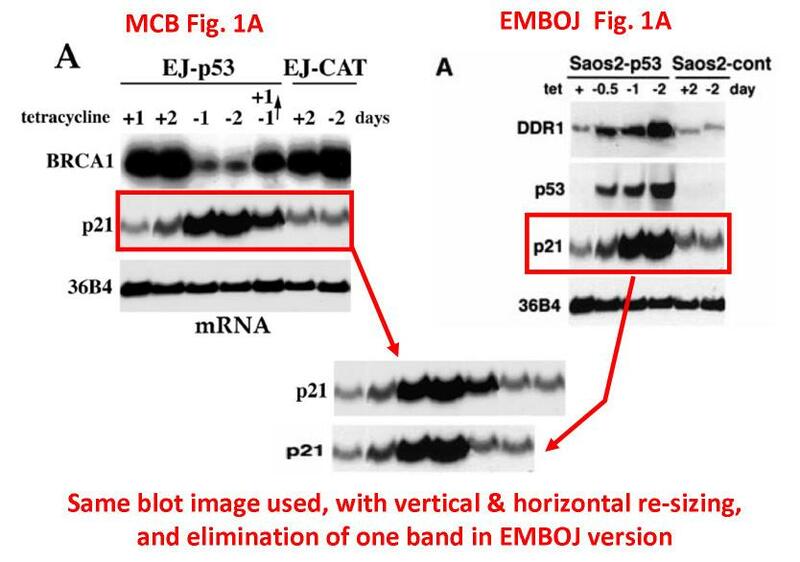 Please compare the p53 and p21 panels figure 1A EMBO J. 2002 Nov 1;21(21):5635-44. This applies to the editor of Proc Natl Acad Sci U S A. 1997 Sep 2;94(18):9648-53. Proc Natl Acad Sci U S A. 2007 Oct 16;104(42):16633-8. Figure 3A. Female actin panel. Please compare bands in lanes 2 and 3 with bands in lanes and 10 and 11. Female p53 panel. Please compare bands in lanes 4 and 6. Male p53 panel. Vertical change in background between lanes 6 and 7. Actin panel. No vertical changes in background. Figure 4A. C57BL/6 male actin panel. Please compare bands in lanes 3 and 4 with bands in lanes 11 and 12. Please compare band lane 6 right actin panel figure 4B (C57BL/6 male) with vertically stretched vertical mirror image of band lane 9 C57BL/6 female actin panel figure 4D. The editor of Proc Natl Acad Sci U S A. 1997 Sep 2;94(18):9648-53.
is also an author of the publication below. Cancer Res. 1999 Aug 1;59(15):3663-70. DNA damage increases sensitivity to vinca alkaloids and decreases sensitivity to taxanes through p53-dependent repression of microtubule-associated protein 4. Zhang CC, Yang JM, Bash-Babula J, White E, Murphy M, Levine AJ, Hait WN. Department of Medicine, University of Medicine and Dentistry of New Jersey-Robert Wood Johnson Medical School, Piscataway 08854, USA. p53 panel. Please compare bands lanes 1 and 5. Please compare band lane 4 with horizontal mirror image band lane 1. Please compare bands lanes 2, 3 and 6. MAP4 panel. Please compare bands lanes 1 and 2 with bands lanes 5 and 6 respectively. Please compare bands lanes 3 and 4 with horizontal mirror images of bands lanes 1 and 2. So that things are all gathered under one roof. 2. Figure 1A EMBO J 2003;22;1289-301; PMID12628922 ? The Bayesian landscape shifts some more. I hope the observations below have not been reported elsewhere. For sure, it is a little hard to keep track of all discussion concerning the prolific output of this scion of the house of Harvard. Therefore, my apologies if I am reporting what is already known. 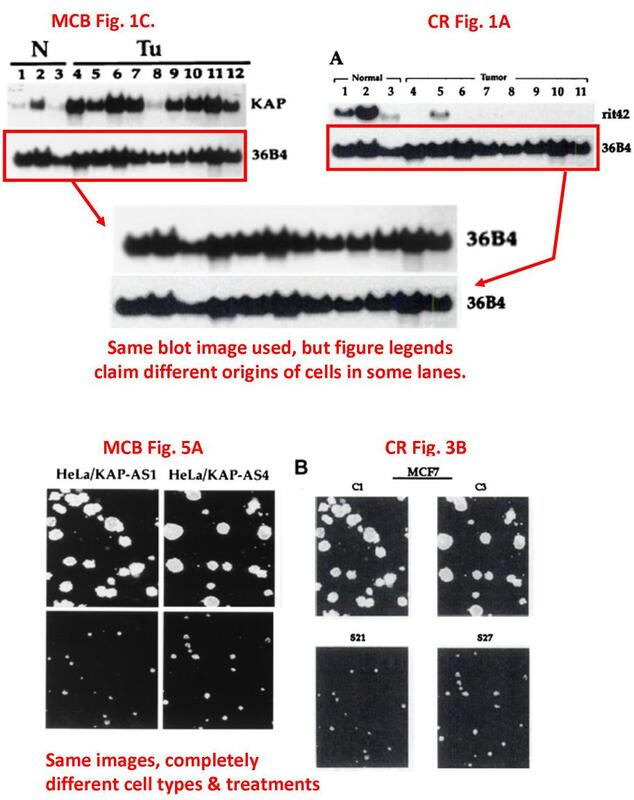 In that very same MCB 2000/20/7450-Fig.1A-p21 slice (so intimately connected to the once and future EMBO J paper as you have reminded us), lanes 6 and 7 are identical. Their band shapes and the shared dot lower right, plus the visible vertical splice lines, leave no room for doubt. Interestingly, if a tad less thrillingly, lane 1 is also spliced onto the gel, with a rather unusual zig-zag splice edge. Moving on to Fig. 2A, there is a horizontal edge under the bands in the p21 slice of MCF7, indicating that two bands were spliced into lanes 2 and 3. In Fig. 2B, lanes 1 and 3 of PC3 in the top BRCA1 slice are identical. Gel resets itself to zero at 24 hours? Groundhog day? There are plenty of sharp splices between lanes elsewhere in the figures of this article. However, it is so much more decisive if one can find lane duplications that I won’t list them now. On the topic of duplications. Also by T Ouchi the senior author of J. Biol. Chem. 2004. Mol Cancer Ther. 2008 Aug;7(8):2509-16. Figure 1C. PTEN panel. Please compare the bands in lanes 2 and 5. Figure 2B. Actin panel. Please compare the bands in lanes 5 and 8. Figure 3B. CK-II alpha panel. Please compare bands lanes 5 and 6. In Mol Cancer Ther. 2008 Aug;7(8):2509-16. Fig. 1C PTEN panel bands in lanes 1 and 4 are very similar, as are bands in Chk1 panel lanes 1,2 and 4,5, and 11,12 and 14,15. Shionome Y, Lin WH, Shiao HY, Hsieh HP, Hsu JTA, Ouchi T. A Novel Aurora-A Inhibitor, BPR1K0609S1, Sensitizes Colorectal Tumor cells to 5-Fluorofracil (5-FU) Treatment. Int J Biol Sci 2013; 9(9):947. doi:10.7150/ijbs.9.947. J Biol Chem. 2003 Jan 17;278(3):2015-20. Epub 2002 Nov 8. Cell cycle differences in DNA damage-induced BRCA1 phosphorylation affect its subcellular localization. Figure 2B. S1524 panel. Band lane 17 (rightmost lane) is on own rectangle of grainy background, whereas the general background is monotonous. Figure 3B. S988 panel. Please compare bands lanes 9 and 10. Band lane 17 (rightmost) lane is on its own rectangle of lighter than general background. Figure 1A. Procaspase-3 panel. Vertical, straight change in background between lanes 4 and 5. 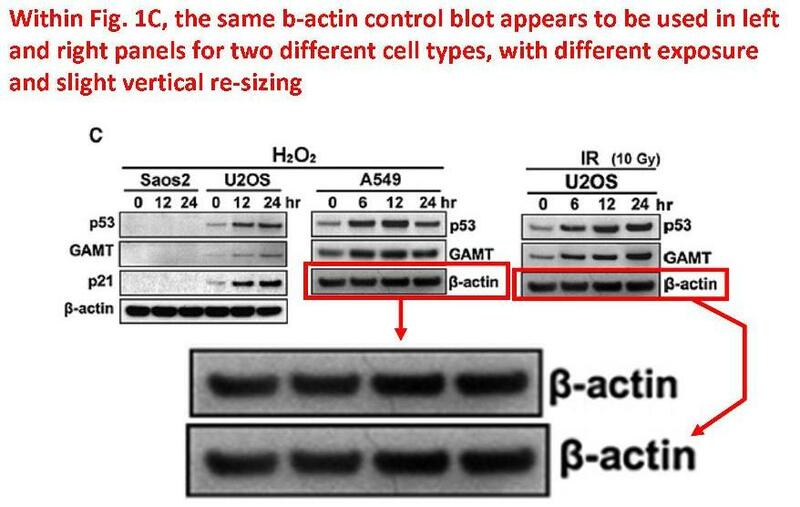 No vertical changes in background in the cleaved caspase-3, BRCA1 C20, or tubulin panels. Figure 2A. Procaspase-9 panel. Please compare lanes 2 and 4.
with lanes 1 and 2 procaspase-3 panel figure 1B. The bands in the accompanying procaspase-3 and tubulin panels are different. Note: in lane 3 procaspase-3 panel figure 1B band lane 3 has truncated left end. I believe that it the same person. Cancer Res. 2011 Mar 1;71(5):1836-48. doi: 10.1158/0008-5472.CAN-10-2836. Epub 2011 Jan 17. Parallel high-throughput RNA interference screens identify PINK1 as a potential therapeutic target for the treatment of DNA mismatch repair-deficient cancers. Martin SA, Hewish M, Sims D, Lord CJ, Ashworth A. Cancer Research UK Gene Function and Regulation Group, The Institute of Cancer Research, London, United Kingdom. with beta tubulin panel figure figure 1A EMBO Mol Med. 2009 Sep;1(6-7):315-22. I believe the recorded genotypes of the cells are different and the recorded treatments are different. with horizontal mirror image bands HEC59 (MSH2-ve) beta-tubulin panel figure 1E Cancer Cell. 2010 Mar 16;17(3):235-48. I believe that the recorded treatments are different. with horizontal mirror image of bands lanes 1 and 2 PTEN panel figure 1A EMBO Mol Med. 2009 Sep;1(6-7):315-22. EMBO Mol Med. 2009 Sep;1(6-7):315-22. doi: 10.1002/emmm.200900041. Synthetic lethal targeting of PTEN mutant cells with PARP inhibitors. Mendes-Pereira AM, Martin SA, Brough R, McCarthy A, Taylor JR, Kim JS, Waldman T, Lord CJ, Ashworth A. The Breakthrough Breast Cancer Research Centre, The Institute of Cancer Research, London, UK. Cancer Cell. 2010 Mar 16;17(3):235-48. doi: 10.1016/j.ccr.2009.12.046. DNA polymerases as potential therapeutic targets for cancers deficient in the DNA mismatch repair proteins MSH2 or MLH1. Martin SA, McCabe N, Mullarkey M, Cummins R, Burgess DJ, Nakabeppu Y, Oka S, Kay E, Lord CJ, Ashworth A. Cancer Research UK Gene Function and Regulation Group, The Institute of Cancer Research, London SW3 6JB, UK. Figure 1. Please compare the HEC59 beta-tubulin panel figure 1E with a vertically stretched version of the HCT116 beta-tubulin panel figure 1F. Please pay attention to the grey plumes below the right ends of the bands in lanes 2 and the grey plumnes above the right (head end) of the bands in lanes 3. Figure 1F. HCT116 + Chr 3 panels. Please compare band lane 1 POLG panel with band lane 2 beta-tubulin panel, and with horizontal mirror image band lane 3 HCT116 tubulin panel (also figure 1F). Figure 3 (page 240). The way it is laid out is confusing. Figure legends on different pages from figures. Time honoured tradition. with bands beta-tublin HCT116 panel figure 1F. with bands HCT116 + Chr3 beta-tubulin panel figure 1F. bands beta-tubulin panel figure 2D (page 238). with bands bands beta-tubulin panel figure 2D (page 238) (HCT116 and HCT116 +Chr3 cells according to what in written under the lanes in figure 2D and in the figure legend 2D). with bands lanes 2,3,4 and 5 HCT116 +Chr3 nonspecific panel figure 3G. Figure S4. Please compare: HEC59 +Chr2 panel figure S4A with lanes 3,4 and 5 HCT116 +Chr3 (MLH1+ve) panel figure 3G. with lanes 4,5 and 6 RAD51 panel figure 1A EMBO Mol Med. 2009 Sep;1(6-7):315-22.
with lanes 1,2 and 3 beta-tubulin panel figure 1 EMBO Mol Med. 2009 Sep;1(6-7):315-22, where the HCT116 cells have various genotypes. with bands lanes 2,3 and 4 PTEN panel figure 1A EMBO Mol Med. 2009 Sep;1(6-7):315-22. PLoS One. 2009;4(4):e5120. doi: 10.1371/journal.pone.0005120. Epub 2009 Apr 9. Integrated functional, gene expression and genomic analysis for the identification of cancer targets. Iorns E, Lord CJ, Grigoriadis A, McDonald S, Fenwick K, Mackay A, Mein CA, Natrajan R, Savage K, Tamber N, Reis-Filho JS, Turner NC, Ashworth A. The Breakthrough Breast Cancer Research Centre, The Institute of Cancer Research, London, United Kingdom. Please compare the beta-tubulin panel figure 4B with the first 2 lanes of the beta-Tubulin panel figure 4A. Please compare the beta-tubulin panel figure 4E with the beta-tubulin panel figure 4A. how did i miss this yesterday! too much to digest David. Integrative molecular and functional profiling of ERBB2-amplified breast cancers identifies new genetic dependencies. Shiu KK, Wetterskog D, Mackay A, Natrajan R, Lambros M, Sims D, Bajrami I, Brough R, Frankum J, Sharpe R, Marchio C, Horlings H, Reyal F, van der Vijver M, Turner N, Reis-Filho JS, Lord CJ, Ashworth A.
EMBO J. 2012 Mar 7;31(5):1160-76. doi: 10.1038/emboj.2011.490. Epub 2012 Jan 31. APRIN is a cell cycle specific BRCA2-interacting protein required for genome integrity and a predictor of outcome after chemotherapy in breast cancer. Brough R, Bajrami I, Vatcheva R, Natrajan R, Reis-Filho JS, Lord CJ, Ashworth A. Cancer Research UK Gene Function and Regulation Group, London, UK. Please compare the WCL APRIN panel figure 6B with the WCL BRCA2 panel figure 5C. David Hardman wrote “PLoS One. 2009;4(4):e5120. doi: 10.1371/journal.pone.0005120. Epub 2009 Apr 9. A correction has been published in addition to the potential ‘error’ above collating figures. Is this a worrying trend or a one off? Proc Natl Acad Sci U S A. 2010 Jul 20;107(29):12913-8.
the Wt SB203580 and Wt DMSO dishes in figure 4C look the same. In the corrected figure 4 the DMSO dish in figure 4C has been replaced. I might be missing something. 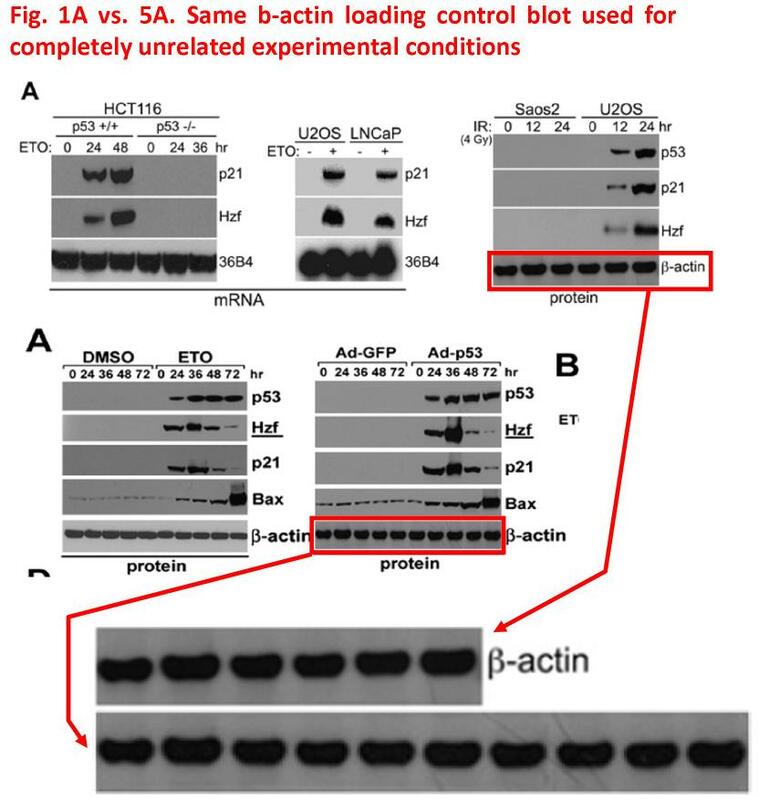 Figure 4B: The B-actin bands look over exposed. The ‘actual’ expression of B-actin may be very different in each lane but as the bands all look over-exposed it is impossible to say. Some of the authors on the work are very experienced and the yet work appears sloppy. I agree with the pubpeer comments that it is indeed impossible to quantitate bands that are over exposed. The authors make no comment. 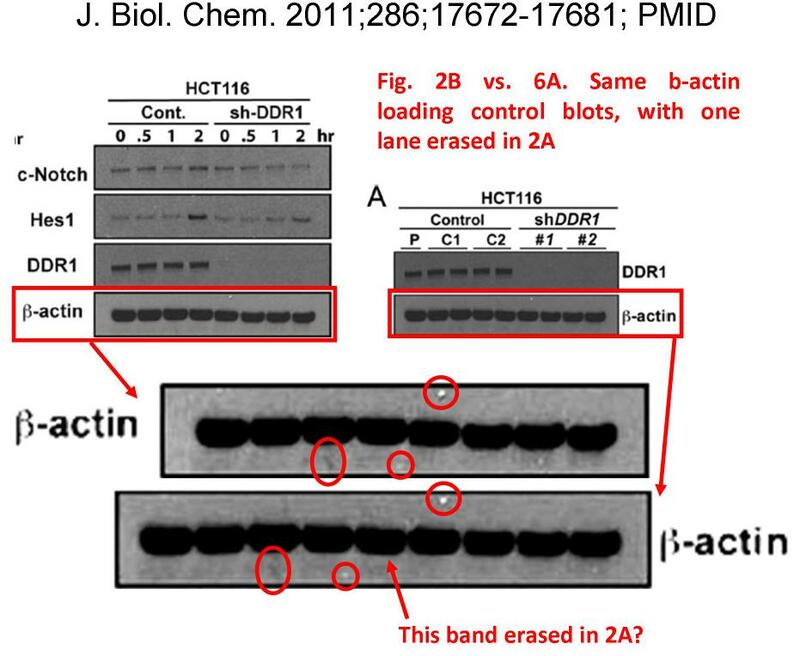 If you would kindly look at the Acin bands in figure 5D (Nbr1) you may see the exposure is minimal and there is a clear difference in expression. I suspect if those bands were over-exposed there would be no visual difference in expression similar to figure 4B – which , of course, would be inaccurate. Figure 4 Proc Natl Acad Sci U S A. 2010 Jul 20;107(29):12913-8. The correction avoids the physics. 3. background lane 4 p-p38 MAPK panel is lighter than other lanes. Scrutineer September 2, 2013 at 4:51 pm in a comment in this very post. Mol Cell Biol. 2000 Oct;20(20):7450-9. The affiliations look different, but Guy’s hospital is part of King’s College, London, and the postcodes are the same. oh no! another high profile group! On the tpoic of high profile groups here is one from another high profile British group. J Biol Chem. 2002 Apr 5;277(14):12040-6. Epub 2002 Jan 28. Fibroblast growth factor-2 induces translational regulation of Bcl-XL and Bcl-2 via a MEK-dependent pathway: correlation with resistance to etoposide-induced apoptosis. Pardo OE, Arcaro A, Salerno G, Raguz S, Downward J, Seckl MJ. Cancer Research United Kingdom Lung Cancer Biology Group and the Medical Research Council Clinical Sciences Centre, Hammersmith Campus of Imperial College, Ducane Road, London W12 0NN, United Kingdom. Figure 2. J Biol Chem. 2002 Apr 5;277(14):12040-6. Please compare figure 2B J Biol Chem. 2002 Apr 5;277(14):12040-6 with figure 6A Oncogene. 2001 Nov 15;20(52):7658-67. Please compare figure 2C J Biol Chem. 2002 Apr 5;277(14):12040-6 with figure 6B Oncogene. 2001 Nov 15;20(52):7658-67. Lamin B panel figure 3B Oncogene. 2001 Nov 15;20(52):7658-67. Please note the shapes of the bands and the grey dot over the right end of the bands in lanes 7.
with H69 Lamin B panel figure 3A Oncogene. 2001 Nov 15;20(52):7658-67.
with H69 P-ERK1/P-ERK2 panel figure 3A Oncogene. 2001 Nov 15;20(52):7658-67.
with H69 lower Lamin B panel figure 3A Oncogene. 2001 Nov 15;20(52):7658-67. J Biol Chem. 2002 Apr 5;277(14):12040-6 has found a home on Pubpeer. One wrong more to man, one more insult to God! Life’s night begins: let him never come back to us! Never glad confident morning again! An Oxford blooper. Image quality is quite good. Mol Cell Biol. 1999 Sep;19(9):6427-40. Functional analysis of H-Ryk, an atypical member of the receptor tyrosine kinase family. Katso RM, Russell RB, Ganesan TS. Molecular Oncology Laboratories, Imperial Cancer Research Fund, Institute of Molecular Medicine, John Radcliffe Hospital, Headington, Oxford OX3 9DS, United Kingdom. Please compare bands lanes 5 and 8.
vertical changes in background on either side of the bands in lane 2. Horizontal straight changes in background above and below bands. Suspect a composite. The bands zero and 5 minute lanes lighter than band in later lanes. The change is abrupt. It is supposed to be a time series. Bands in lanes 6,7, and 8 have flat straight tops. The right 2/3rds top band lane 5 is flat and straight. Please compare band lane 5 and band lane 8. Band lane 8 is right up against the right edge of the panel. The left edge of band lane 8 is vertical, and straight. The little plume above the left top edge of band lane 5 has likely been cut off in band lane 8. Please compare TrkA:Ryk bands 15 and 25 minute lanes. Please compare TrkA:Ryk bands 20 and 30 minute lanes. Please compare pp75 bands zero and 60 minute lanes. Please compare pp75 bands 5 and 15 minute lanes. Please compare pp75 bands zero and 10 minute lanes. Figure 7B. Please compare 30 minute pp75 band with horizontal mirror image 15 munite pp75 band. Please compare 60 minute pp75 band with horizontal mirror image 10 munite pp75 band. Figure 8A. Top panel. Please compare the zero, 10 and 15 minute pp75 bands. Please compare the 25 and 60 minute pp75 bands. Re: Mol Cell Biol. 1999 Sep;19(9):6427-40. Figure 4A. RT-PCR for beta-actin panel. Day 8 Course 1 lane. Left edge of signal is vertical and straight. There is a vertical, dark streak between the Day 8 Course 1 lane (lane 3) and the Day 1 Course 2 lane (lane 4). The resolution is low, but how different are the bands in lanes 2 and 4, and in lanes 3 and 5? L’hôte CG, Thomas PH, Ganesan TS. FASEB J. 2002 Feb;16(2):234-6. Epub 2001 Dec 28. Fig. 6. Of the 6 gel panels, 5 have had some repair work with squares taken from elsewhere pasted over offending entities, always toward the left side. To see this best, do some levels work on the image in photoshop. The upper central gel is tantamount to a patchwork quilt. Strangely the improved lanes are not labelled, so might have had tell tale markers. But why not just cut them off if they interfered with the story being told? Fig. 9A exhibits more repair work on unwanted gelly blemishes. One square carelessly overruns the left hand frame. Between 360 and 0 it is raining squares. Best viewed in Photoshop with a spot of darkening applied. Fig. 11. A swirling phantasia in halftone, placed upon a whiter shade of pale. Another dreamy paper on RYK from the dreaming spires. Same senior author, trademark whiter than white canvas for blot creation. That’s handy if you need to splice in lanes that are a bit short, or later on want to use white rectangles to cover up any unwanted bits. 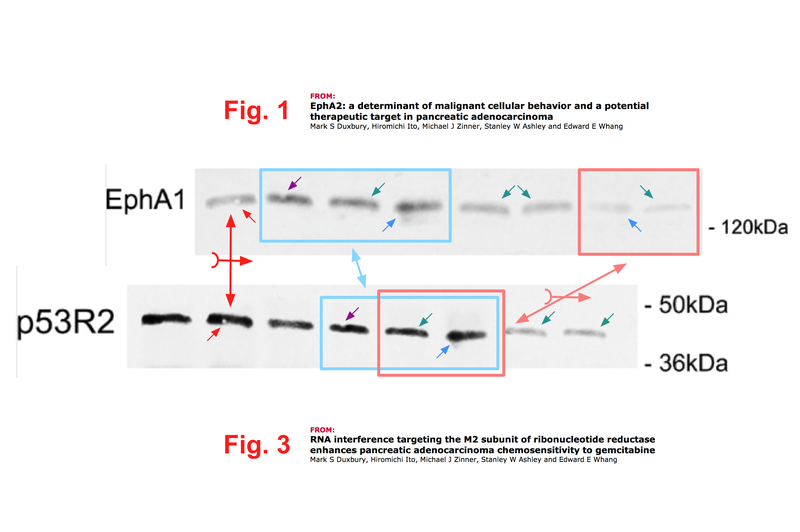 RYK, a catalytically inactive receptor tyrosine kinase, associates with EphB2 and EphB3 but does not interact with AF-6. J Biol Chem. 2002 Jun 21;277(25):23037-43. Fig. 5. Upper panel. There appear to be two white rectangles making an L-shape to lower left. See the lower left edges of lanes 2, 3 and 4. Either due to short lanes being spliced in, or rectangles added afterwards. Lane 6 also has a straight lower edge. The left edge of lane 6 also has some straight parts, hinting that it is spliced on. Fig. 6. 3rd panel down. Lower right band has several straight edges toward lower left corner indicating little white rectangles were overlaid to hide something nasty. Fig. 8. Wouldn’t mind some second opinions on this. Stare long and hard at lanes 2 and 3 of panel B. It looks as though the matter in lane 2 has been added to other matter in lane 3. See the vertical “pod with 3 peas” shape to the left of each lane. See the two curved bands in lane 2 and the two curved bands in lane 3 at the same level. Observe the pale curve in lane 3 that traces out the same edge shape as the lower right edge in lane 2. Fig. 10. Panel A. Lanes 4 and 5 look like they share common ancestry disguised with differential use of a healing brush or spray paint effect to whiten out bits above and below the the two main bands. Would need to see the “original” exposure to be sure. Home found for Mol Cell Biol. 1999 Sep;19(9):6427-40 at Pubpeer. “With inky blots and rotten parchment bonds”. ..is now bound in with shame..
Re: J Biol Chem. 2002 Jun 21;277(25):23037-43. I agree, the majority of panels have white backgrounds and that this comes in handy as a canvas. A problem is that most journals will say something like “the use of monochrome panels is below best practice” and may even go as far as saying that they would not encourge such behaviour, but will ignore the physics of the blank canvas. I want to send you some details about this group. How can I contact you? Epigenetics. 2009 May 16;4(4):265-9. Epub 2009 May 1. 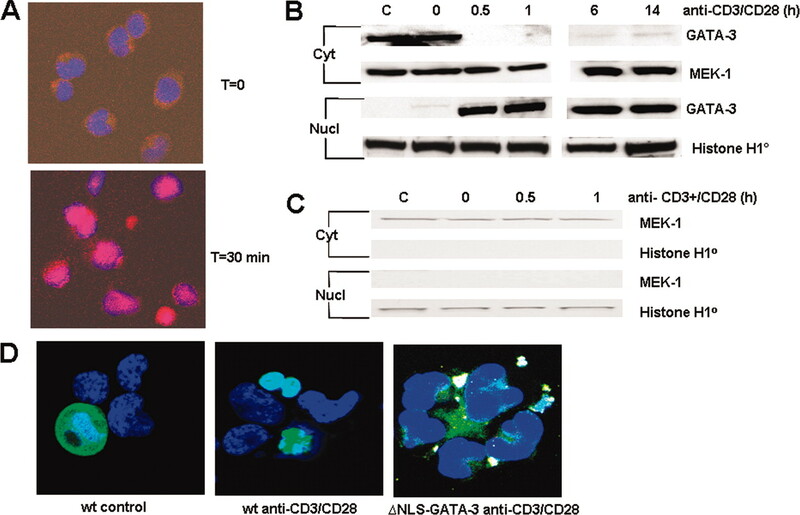 Frequent epigenetic inactivation of the SLIT2 gene in chronic and acute lymphocytic leukemia. Dunwell TL, Dickinson RE, Stankovic T, Dallol A, Weston V, Austen B, Catchpoole D, Maher ER, Latif F.
Section of Medical and Molecular Genetics, Institute of Biomedical Research, University of Birmingham, Birmingham B15 2TT, UK. Figure 1C. GAPDH panel. Please compare band lane 1 with band lane 6. Please compare band lane 2 with band lane 7.
with GAPDH panel figure 1C Oncogene. 2008 Mar 13;27(12):1805-11. The recorded cells in the figures are different. These cannot have been accidental duplications. Because there are multiple authors, an investigation must be carried out by the University of Birmingham, in which they secure the primary data, and independently interview all the authors. An independent authority should also provide oversight to make sure the university does a thorough job. It must be said the University of Birmingham has an excellent reputation. It would be unfortunate if this was handled inappropriately. I am sure it won’t be, and we all know accidents can happen and we must be patient. Another one from the heart of England. Br J Cancer. 2004 Dec 13;91(12):2071-8. 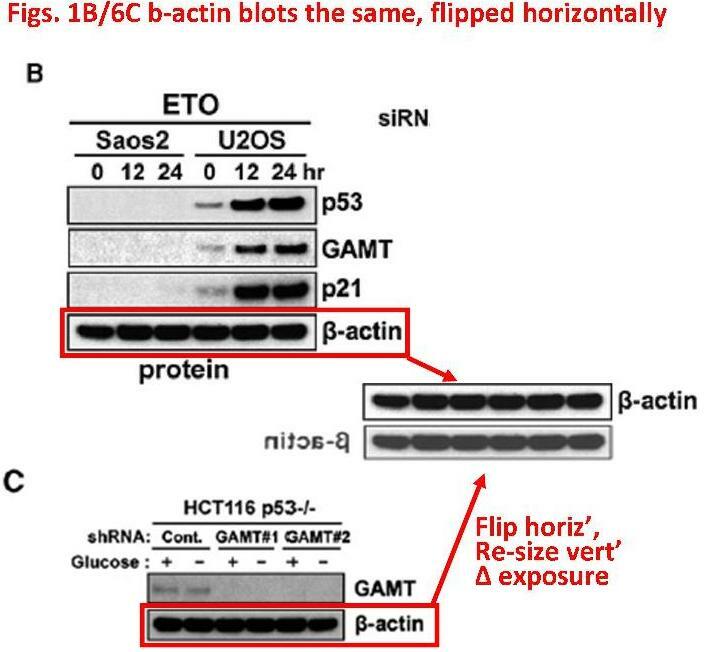 Epigenetic inactivation of SLIT3 and SLIT1 genes in human cancers. Dickinson RE, Dallol A, Bieche I, Krex D, Morton D, Maher ER, Latif F.
Section of Medical and Molecular Genetics, Division of Reproductive and Child Health, Institute of Biomedical Research, University of Birmingham, Birmingham B15 2TT, UK. Figue 5B. GAPDH control panel. Please compare bands lanes 4 and 9. Please compare bands lanes 5, 7 and 10. Please compare bands lanes 6 and 8. The first lane of Fig 3B SLIT3 appears to be pasted on. Cancer Res. 2005 Apr 1;65(7):2690-7. Transcriptional regulation of cyclin A2 by RASSF1A through the enhanced binding of p120E4F to the cyclin A2 promoter. Ahmed-Choudhury J, Agathanggelou A, Fenton SL, Ricketts C, Clark GJ, Maher ER, Latif F.
Section of Medical and Molecular Genetics, Division of Reproductive and Child Health, Institute of Biomedical Research, University of Birmingham, Birmingham, United Kingdom. Please compare bands lanes 3 and 5. Please compare bands lanes 4 and 6. Figure 5B. Vertical, straight chnage in signal between lanes 2 and 3. And yet already you have moved on to the (semi-mythical and very much post-)industrial heartland of England, with its dark satanic mills so painstakingly restored by English Heritage. It’s not easy to keep up. At this rate of northwards progress, you will soon be reporting to us on the many fishy blots emanating from North Rona University. But before you move on to pastures anew, do take one further look at that Brummie image, concentrating this time on the part 5A. Lanes 1-7 are assigned to cell line HB2. Lanes 8-9 are assigned to the most famous cell line in the whole wide world, the immortal HeLa. Lanes 1-7 are lower resolution that lanes 8-11. There is a splice between lanes 7 and 8. All of which points to two gels being spliced together. That’s naughty. However, perhaps in a spirit of economy appropriate for these straightened times, it turns out only one gel was spliced together. For lanes 8-11 are also lanes 2-5. Higher resolution to be sure, vertically stretched too, but still the same lanes. Look at the specks shared by lanes 4 and 10 and all doubt will be lost. Also see lanes 5, 7 and 10. Are they identical? When they are enlarged they look identical. Is this a first ‘triple hit’ in a single gel? At least it is only in a gel. Cancer Res. 2005 Apr 1;65(7):2690-7. part 5A. “For lanes 8-11 are also lanes 2-5. Higher resolution to be sure, vertically stretched too, but still the same lanes. Look at the specks shared by lanes 4 and 10 and all doubt will be lost. How right you are! Well spotted! The spots in the upper parts of lanes 4 and 10. I left 5A alone as it was not so easy to what was going on. It did need the logical leap kindly provided. Figure 1C: GAPDH lanes 1+ 2 are identical to lanes 6+7. You may also see the tell-tale sign of a sliced lane at the top of lane 2. The cut out lanes were not quite fitted closely together. To be fair, they did try very hard to fit them closely together so I give them credit. Perhaps the other gels need a closer look. May I ask our colleagues – where was the funding from which supported this work? Endocr Relat Cancer. 2008 Sep;15(3):777-86. doi: 10.1677/ERC-08-0072. Epub 2008 May 22. Evaluation of a functional epigenetic approach to identify promoter region methylation in phaeochromocytoma and neuroblastoma. Margetts CD, Morris M, Astuti D, Gentle DC, Cascon A, McRonald FE, Catchpoole D, Robledo M, Neumann HP, Latif F, Maher ER. Department of Medical and Molecular Genetics, Institute of Biomedical Research Cancer Research, UK. We thank the Cancer Research UK and the University of Birmingham for financial support. Please compare bands lanes 1,3 and 5. Please compare bands lanes 2,4 and 6. HSP47 (a) panel. Band lane 1 has vertical, straight right end. Band lane 3 has vertical, straight left end. Epigenetics. 2011 Mar;6(3):326-32. Epub 2011 Mar 1. Frequent epigenetic inactivation of KIBRA, an upstream member of the Salvador/Warts/Hippo (SWH) tumor suppressor network, is associated with specific genetic event in B-cell acute lymphocytic leukemia. Hill VK, Dunwell TL, Catchpoole D, Krex D, Brini AT, Griffiths M, Craddock C, Maher ER, Latif F.
Medical and Molecular Genetics, Institute of Biomedical Research, School of Clinical and Experimental Medicine, College of Medical and Dental Sciences, University of Birmingham, UK. Figure 4B. Please compare band right lane GAPDH panel 1 with band left lane GAPDH panel 2. I agree on bands 1, 3 and 5 of the EMP3 panel. Lanes 2, 4 and 6 have slightly different exposures, but blowing them up and looking at landmarks suggests they are the same band reproduced. In addition: The TMS1 lane, band 8 looks spliced in. Oncogene. 2007 Mar 8;26(11):1661-72. Epub 2006 Sep 25. Identification of novel VHL targets that are associated with the development of renal cell carcinoma. Abdulrahman M, Maina EN, Morris MR, Zatyka M, Raval RR, Banks RE, Wiesener MS, Richards FM, Johnson CM, Latif F, Maher ER. Department of Medical and Molecular Genetics, University of Birmingham, The Medical School, Birmingham, UK. Figure 1g. Please compare the loading control panels for pair 36 (left panel) and pair 5 (right panel). Figure 12B. Bottom panel. Vertical, grey streak/change in background between the 30 and 40 minute lanes. Figure 12D. Top panel. Vertical change in bacground between the lower halves of the NIH 3T3 and zero minute lanes. Oncogene. 2007 Feb 1;26(5):683-700. Epub 2006 Jul 31.RPS6KA2, a putative tumour suppressor gene at 6q27 in sporadic epithelial ovarian cancer. Bignone PA, Lee KY, Liu Y, Emilion G, Finch J, Soosay AE, Charnock FM, Beck S, Dunham I, Mungall AJ, Ganesan TS. Cancer Research UK, Molecular Oncology Laboratories, Ovarian Cancer Group, Weatherall Institute of Molecular Medicine, John Radcliffe Hospital, Headington, Oxford, UK. Figure 3 page 688, the legend is on page 689. Figure 3c. There are steps in the levels of the bands between lanes 2 and 3, and between lanes 4 and 5. The right end of the band lane 4 is vertical and straight with a vertical, light streak right next to it. Figure 4 page 690, the legend is on page 691. Figure 4a panel. Vertical, straight edge to signal just to right of upper band in lane 1. Figure 5b. p21 panel. Step in level of bands between lanes 1 and 2. Vertical, grey streak at right end of band lane 1. Figure 6 page 694, legend is on page 695. Figure 6c. Rps6KA2c panel. Vertical, straight, dark strip between the leukocyte and -ve lanes. RPS6KA2a panel. Vertical, straight chnage in background between the leukocyte and -ve lanes. Mol Cell. 2005 Dec 9;20(5):673-85. Involvement of MINK, a Ste20 family kinase, in Ras oncogene-induced growth arrest in human ovarian surface epithelial cells. Nicke B, Bastien J, Khanna SJ, Warne PH, Cowling V, Cook SJ, Peters G, Delpuech O, Schulze A, Berns K, Mullenders J, Beijersbergen RL, Bernards R, Ganesan TS, Downward J, Hancock DC. Signal Transduction Laboratory, Cancer Research UK London Research Institute, 44 Lincoln’s Inn Fields, London WC2A 3PX, United Kingdom. Figure 1D. Mock pan ras panel. White. V12 Ras P-Akt panel. The background around many parts of of the bands in the right 2 lanes looks white. Figure 5. Please compare the bands in the left 2 lanes of the loading panels in figures 5B and 5C. Please compare the bands in the left 2 lanes of the P-MKK3/6 panels in figure 5B and 5C. The bands in left 2 lanes of the respective P-p38 panels are different. Figure 5B. Vertical changes in background between lanes 2 and 3 of the P-p38, P-MKK3/6, Cylin A, and p21 panels. No vertical changes in background in the MINK, P-ERK, pan ras or loading panels. Figure S2A. P-MKK3/6 panel. Vertical change in background between lanes 2 and 3. No vertical changes in background in the P-p38, cyclin A, p21 or loading panels. Figure S3A. Loading panel. Bands in lanes 2 and 3 are in a white lacuna, whereas the general background is grey. BMC Genet. 2002 Oct 15;3:20. Epub 2002 Oct 15. The human homologue of unc-93 maps to chromosome 6q27 – characterisation and analysis in sporadic epithelial ovarian cancer. Liu Y, Dodds P, Emilion G, Mungall AJ, Dunham I, Beck S, Wells RS, Charnock FM, Ganesan TS. Cancer Research UK Molecular Oncology Laboratories, Weatherall Institute of Molecular Medicine, John Radcliffe Hospital, Headington, Oxford, OX3 9DS, UK. Figure 4A. UNC93A panel. Vertical, straight changes in signal between lanes 1,2 and 3. GAPDH panel. Band lane 3 has vertical, straight left edge. Physical and transcript map of the region between D6S264 and D6S149 on chromosome 6q27, the minimal region of allele loss in sporadic epithelial ovarian cancer. Liu Y, Emilion G, Mungall AJ, Dunham I, Beck S, Le Meuth-Metzinger VG, Shelling AN, Charnock FM, Ganesan TS. ICRF Molecular Oncology Laboratories, John Radcliffe Hospital, Headington, Oxford, OX3 9DS, UK. Figure 3d. GAPDH panel. Vertical, straight changes in background between lanes 1,2 and 3. Please compare lane 3 with right vertical third lane 1 and lane 2. Please compare the GPADH panel figure 3d with the GAPDH panel figure 4c. J Immunol. 2007 Feb 15;178(4):2491-8. 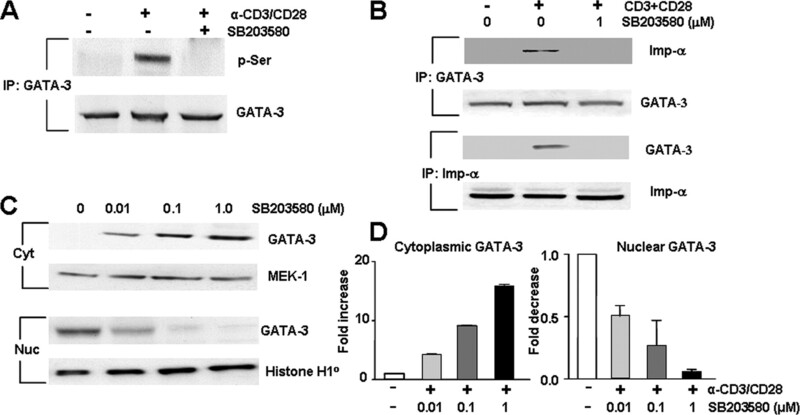 Regulation of Th2 cytokine genes by p38 MAPK-mediated phosphorylation of GATA-3. Maneechotesuwan K, Xin Y, Ito K, Jazrawi E, Lee KY, Usmani OS, Barnes PJ, Adcock IM. Section of Airway Disease, National Heart and Lung Institute, Imperial College, London, United Kingdom. Figure 4A. IL-4 INPUT panel. Suspect that the bands in the 1st two lanes are images of the same thing. Figure 4B. IL-4 panel. Suspect that the bands in the 2nd and 4th lanes are different exposures of the same thing. Upper GAPDH panel. Suspect that all the bands are different exposure so the same thing. The bands in lanes 1 and 4 are the same size, the bands in lanes 2 and 3 are the same size. Nucl set of panels, Histone 1zero panels. Left panel. The bands in the 3rd and 4th lanes look like repeats. The bands in the 1st and 2nd lanes look like re-sized versions of these. Right panel. The bands look like horizontally elongated mirror images of the bands in the left panel. Figure 4A. Total p38 MAPK panels. Left panel. Bands in lanes in 1st, 2nd,3rd, 4th and 5th lanes likely reworked repeats. Right panel. Bands in right-most lanes repeats. Figure 4B. Suspect undisclosed splicing on of the last lane in the left panels. Right Total p38 MAPK panel. Suspect that bandsin lanes 1, 4 and 5 are repeats. Sspect tht bands in lanes 2 and 3 are repeats. Figure 4C. Suspect undisclosed splicing between lanes 2 and 3 in both panels. Suspect that the dark “flattened W ” bands in lanes 3, 4 and 5 of top panel are repeats. Suspect that the lanes in the 1st two lanes of the lower panel are repeats. Figure 6B. suspect bands in the upper GATA-3panel are reworkings of the same thing. Figure 1B. SUSPECTED IMAGE/DATA REUSED in PLoS Med. 2009 May; 6(5): e1000076.. Figure 7B. Top panel, cytoplasm band 30 mins becomes cytoplasm band time zero top “space” figure 1A PLoS Med. 2009 May; 6(5): e1000076. Figure 7B. Middle panel, nuclear band time 30mins becomes nuclear band time 30mins middle “space” figure 1A PLoS Med. 2009 May; 6(5): e1000076. Figure 7B. Lower panel, Histone H1zero first two bands become Histone 1 bands lower panel figure 1A PLoS Med. 2009 May; 6(5): e1000076. Figure 1 PLoS Med. 2009 May; 6(5): e1000076. cytoplasm band time zero top “space” figure 1A PLoS Med. 2009 May; 6(5): e1000076. Figure 7B. Please compare middle panel, nuclear band time 30mins withnuclear band time 30mins middle “space” figure 1A PLoS Med. 2009 May; 6(5): e1000076. Figure 7B. 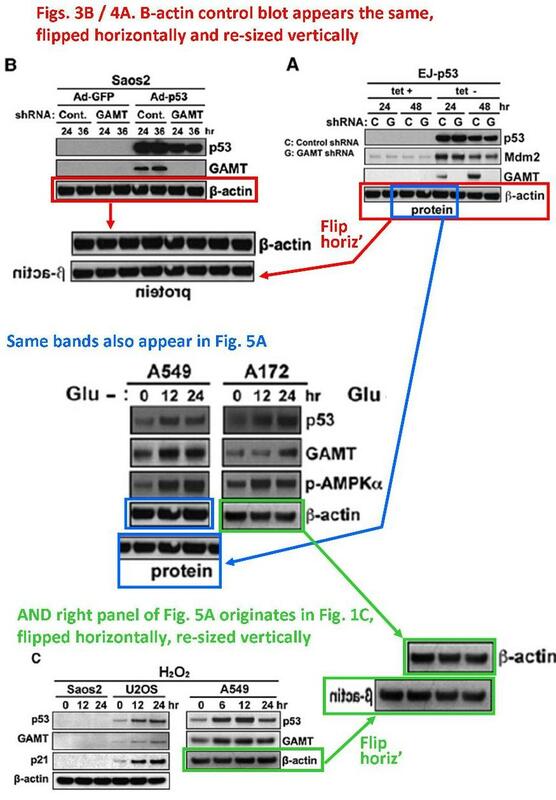 Please compare lower panel, Histone H1zero first two bands with Histone 1 bands lower panel figure 1A PLoS Med. 2009 May; 6(5): e1000076. 1. Int J Cancer. 2001 Dec 1;94(5):652-61. FGF-1 and FGF-2 regulate the expression of E-cadherin and catenins in pancreatic adenocarcinoma. El-Hariry I, Pignatelli M, Lemoine NR. Imperial Cancer Research Fund Molecular Oncology Unit, Imperial College School of Medicine, Hammersmith Campus, London, United Kingdom. with bands T3M4 (middle) panel figure 4A Br J Cancer. 2001 Jun 15;84(12):1656-63. According to the legends the treatments are different. 2. Br J Cancer. 2001 Jun 15;84(12):1656-63. FGF-1 and FGF-2 modulate the E-cadherin/catenin system in pancreatic adenocarcinoma cell lines. Imperial Cancer Research Fund Molecular Oncology Unit, Imperial College School of Medicine, London, UK. Contrasting effects on HIF-1alpha regulation by disease-causing pVHL mutations correlate with patterns of tumourigenesis in von Hippel-Lindau disease. Clifford SC, Cockman ME, Smallwood AC, Mole DR, Woodward ER, Maxwell PH, Ratcliffe PJ, Maher ER. Section of Medical and Molecular Genetics, Department of Paediatrics and Child Health, University of Birmingham, The Medical School, Edgbaston, Birmingham B15 2TT, UK. Please compare the 7th (SER80GLN) and 9th (LEU188Val) panels. Remarkably similar! (I couldn’t see any difference at all). Agreed, they are identical. I note this was over 10 years ago too so a good find. Image quality is quite good. Br J Cancer. 2008 Jan 29;98(2):496-501. doi: 10.1038/sj.bjc.6604180. Epub 2008 Jan 15. Functional epigenomics approach to identify methylated candidate tumour suppressor genes in renal cell carcinoma. Morris MR, Gentle D, Abdulrahman M, Clarke N, Brown M, Kishida T, Yao M, Teh BT, Latif F, Maher ER. Cancer Research UK Renal Molecular Oncology Group, University of Birmingham, Birmingham B15 2TT, UK. Figure 1. Br J Cancer. 2008 Jan 29;98(2):496-501.
with GAPDH panel figure 1 Cancer Res. 2005 Jun 1;65(11):4598-606. The recorded samples are in a different order. is not as clear as that in the figure 1 GAPDH panel Cancer Res. 2005 Jun 1;65(11):4598-606, but the comparison is still possible. Hum Mol Genet. 1996 Dec;5(12):2027-32. Imprinting mutation in the Beckwith-Wiedemann syndrome leads to biallelic IGF2 expression through an H19-independent pathway. Brown KW, Villar AJ, Bickmore W, Clayton-Smith J, Catchpoole D, Maher ER, Reik W.
Department of Pathology and Microbiology, School of Medical Sciences, Bristol, UK. Figure 2A. As well as the thin, vertical, white lines between lanes 5,6 and 7, there are veritcal changes in background. Figure 2B. Vertical streak/change in background between lanes 2 and 3. Vertical streak between lanes 4 and 5. The panels are all cut up. Developmental control of allelic methylation in the imprinted mouse Igf2 and H19 genes. Feil R, Walter J, Allen ND, Reik W.
Laboratory of Developmental Genetics and Imprinting, Babraham Institute, Cambridge, UK. Figure 1B. Vertical change in background between tops of lanes 1 and 2 (includes h8 and h7). Horizontal change in background lanes 2 to 4 (just below level of h7). Vertical, grey line between lanes 4 and 5. Disruption of mesodermal enhancers for Igf2 in the minute mutant. Davies K, Bowden L, Smith P, Dean W, Hill D, Furuumi H, Sasaki H, Cattanach B, Reik W.
Laboratory of Developmental Genetics and Imprinting, Developmental Genetics Programme, Babraham Institute, Cambridge CB2 4AT, UK. Figure 3A. Paternal transmission. H19 and Gapdh panels. Vertical changes in background/vertical streaks between lanes 3,4,5, and between lanes 6 and 7. Igf2 panel. Vertical changes in background between lanes 3,4 and 5. Maternal transmission. Igf2 and Gapdh panels. Vertical changes in background/vertical streaks between lanes 3,4 and 5, and between lanes 6 and 7. H19 panel. Vertical changes in background between lanes 3,4 and 5. Differential splicing makes comparisons problematic. Continuation of tour of England. An East Midlands gem. Blood. 2009 Jun 18;113(25):6498-9; author reply 6499-500. doi: 10.1182/blood-2009-02-203174. p73, miR106b, miR34a, and Itch in chronic lymphocytic leukemia. Rivetti di Val Cervo P, Tucci P, Majid A, Lena AM, Agostini M, Bernardini S, Candi E, Cohen G, Nicotera P, Dyer MJ, Melino G.
MRC-Toxicology Unit, Hodgkin Bldg, PO Box 138, University of Leicester, Lancaster Rd, Leicester, LE1 9HN United Kingdom. Nature. 2012 May 6;485(7399):507-11. doi: 10.1038/nature11058. Sustained translational repression by eIF2α-P mediates prion neurodegeneration. Moreno JA, Radford H, Peretti D, Steinert JR, Verity N, Martin MG, Halliday M, Morgan J, Dinsdale D, Ortori CA, Barrett DA, Tsaytler P, Bertolotti A, Willis AE, Bushell M, Mallucci GR. MRC Toxicology Unit, Hodgkin Building, University of Leicester, Lancaster Road, Leicester LE1 9HN, UK. Yet another East Midlands gem. J Biol Chem. 2010 May 14;285(20):15286-95. doi: 10.1074/jbc.M109.071456. Epub 2010 Mar 12. A simple technique for the prediction of interacting proteins reveals a direct Brn-3a-androgen receptor interaction. Berwick DC, Diss JK, Budhram-Mahadeo VS, Latchman DS. Medical Molecular Biology Unit, University College London Institute of Child Health, London, UK. Figure 3C. GST-Brn-3bL section. Left edge signal left lane too straight and vertical. Vertical, light streaks either side band 2/3rds way up middle band. Figure 5B. alpha-pan Nav panel. Repeated background. Please compare as blocks [right half lane 1 and left half lane 2] with [right half lane 2 and left half lane 3]. J Biol Chem. 2004 May 14;279(20):21617-27. Epub 2004 Feb 16. The Brn-3b transcription factor regulates the growth, behavior, and invasiveness of human neuroblastoma cells in vitro and in vivo. Irshad S, Pedley RB, Anderson J, Latchman DS, Budhram-Mahadeo V.
Medical Molecular Biology Unit, Institute of Child Health, 30 Guilford Street, London WC1N 12EH, UK. Figure 4B. Please compare the left and right Brn-3b-2 panels. Please compare the right 3b-as-1 panel with the left LTR1 panel. Cell Cycle. 2010 Dec 1;9(23):4638-49. Epub 2010 Dec 1. STAT1 interacts directly with cyclin D1/Cdk4 and mediates cell cycle arrest. Dimco G, Knight RA, Latchman DS, Stephanou A. Medical Molecular Biology Unit, Institute of Child Health, University College London, London, UK. paying attention to dark spot above left end band in lanes 2. The accompanying cyclin D1 and CDK4 bands are different. Please compare 2fTGH GAPDH panel figure 5A with U3A-STAT1 – MG121 GAPDH panel figure 4. Please compare U3A GAPDH panel figure 5C with U3A-STAT1 + MG121 GAPDH panel figure 4. Perhaps you have noticed that a new link in the tangled web of image manipulation connecting Boston and the (still) UK is being revealed presently on PubPeer. e.g. From “Athens of the North” to 35 miles west. The imgur image is worth a thousand words. EphA2: a determinant of malignant cellular behavior and a potential therapeutic target in pancreatic adenocarcinoma. Duxbury MS, Ito H, Zinner MJ, Ashley SW, Whang EE. Department of Surgery, Brigham and Women’s Hospital, Harvard Medical School, 75 Francis Street, Boston, MA 02115, USA. 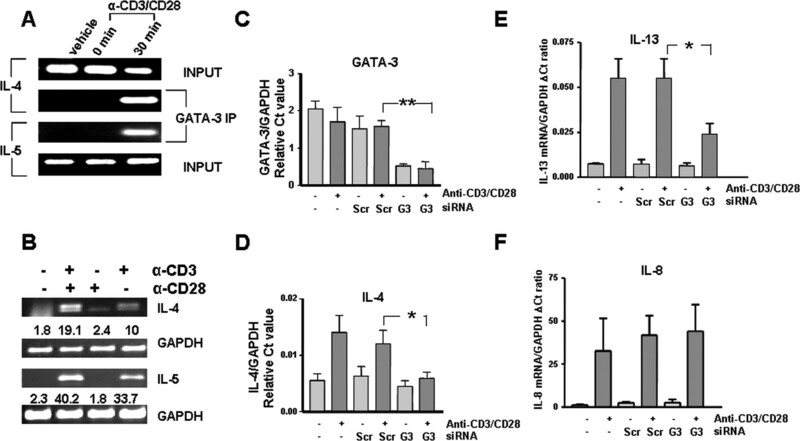 RNA interference targeting the M2 subunit of ribonucleotide reductase enhances pancreatic adenocarcinoma chemosensitivity to gemcitabine. Department of Surgery, Brigham and Women’s Hospital, Harvard Medical School, 75 Francis Street, Boston, Massachusetts, USA. Ah yes – since moved on from Auld Reekie to Red Clydeside. Is the problem of cross-comparing all figures from all publications going to be NP-complete? JAKSTAT. 2013 Jul 1;2(3):e24812. doi: 10.4161/jkst.24812. Epub 2013 May 7. The cardioprotective effects of urocortin are mediated via activation of the Src tyrosine kinase-STAT3 pathway. Chen-Scarabelli C, Saravolatz Ii L, McCaukey R, Scarabelli G, Di Rezze J, Mohanty B, Barry S, Latchman D, Georgiadis V, McCormick J, Saravolatz L, Knight R, Faggian G, Narula J, Stephanou A, Scarabelli TM. Center for Heart and Vessel Preclinical Studies; St John Hospital and Medical Center; Wayne State University; Detroit, MI USA. Figure 1A. Please compare bands lanes 1,2 and 3 left ST1 panel with bands lanes 2,3 and 4 right pST3705 panel. Please compare bands lanes 1,2, and 3 lower ST3 panel figure 1B with bands lanes 2,3 and 4 right ST1 panel figure 1A. Observation#1: no doubt. Two images of 4-lane data from the same blot of 5 lanes. No need to cut and paste. Odd figure in paper by one of the authors of the retracted Mol Cell paper at the beginning of this post. Mol Cell. 2011 Nov 4;44(3):491-501. doi: 10.1016/j.molcel.2011.08.038. ROS-mediated p53 induction of Lpin1 regulates fatty acid oxidation in response to nutritional stress. Assaily W, Rubinger DA, Wheaton K, Lin Y, Ma W, Xuan W, Brown-Endres L, Tsuchihara K, Mak TW, Benchimol S.
Department of Biology, York University, Toronto, ON M3J 1P3, Canada. Figure 1D. Please compare right Lpin1 panel with vertically stretched version upper half right p21 panel. Lpin1 is 22 kDa while p21 is well 21 kDa. The authors might have reprobed the same blot albeit unsuccessfully. Except that reprobing does not cause stretching. Mol Cell Biol. 2000 Oct;20(20):7450-9 has received comments at Pubpeer since October 22nd 2014. Tumor suppressor p53 is required to modulate BRCA1 expression. Arizti P1, Fang L, Park I, Yin Y, Solomon E, Ouchi T, Aaronson SA, Lee SW.
1Department of Medicine, Harvard Medical School and Beth Israel Deaconess Medical Center, Harvard Institutes of Medicine, Boston, Massachusetts 02115, USA. Second retraction for SW Lee. J Biol Chem. 2004 May 7;279(19):19643-8. Epub 2004 Feb 27. BRCA1 phosphorylation by Aurora-A in the regulation of G2 to M transition. Ouchi M1, Fujiuchi N, Sasai K, Katayama H, Minamishima YA, Ongusaha PP, Deng C, Sen S, Lee SW, Ouchi T.
1Derald H. Ruttenberg Cancer Center, The Mount Sinai School of Medicine, New York University, One Gustave L. Levy Place, New York, NY 10029, USA.